Recent real estate reports show that Los Angeles home prices have risen steadily since the third quarter of last year, but naturally homebuyers are more interested in some neighborhoods more than others. To keep track of the most popular areas, the MLS just released a map showing where single-family sales volume has increased the most between the third quarter of 2015 the third quarter of 2016. Simply put, the hottest neighborhoods are where the combined value of all homes sold last quarter has risen most—whether because of increased prices, more total sales, or both. Unsurprisingly, some of the areas where sales volume has increased most include well-advertised hotspots such as Venice and Silver Lake-Echo Park. Some of the city’s priciest areas also had a good quarter, with sizable gains in Brentwood, Malibu, and Malibu Beach—though sales also dropped in Pacific Palisades and Beverly Hills Post Office. Impressively, Bel Air-Holmby Hills saw a slight decrease in the overall number of homes sold last quarter compared to 2015 numbers, but the total value of those homes went up 33 percent. So what’s the hottest neighborhood? That would be Monterey Hills, where seven homes sold last quarter—up from four in the same period a year ago—bringing the sales volume up nearly 140 percent. OK, so that’s a pretty small sample size. More tellingly, sales volume is up 87 percent in Boyle Heights, where 39 homes sold last quarter. That figure certainly supports the common assertion that the area has become LA’s next gentrification hotspot. Speaking of which, flippers and young professionals may be starting to move on from Highland Park and Eagle Rock, where sales volume is down 30 percent and 12 percent respectively. 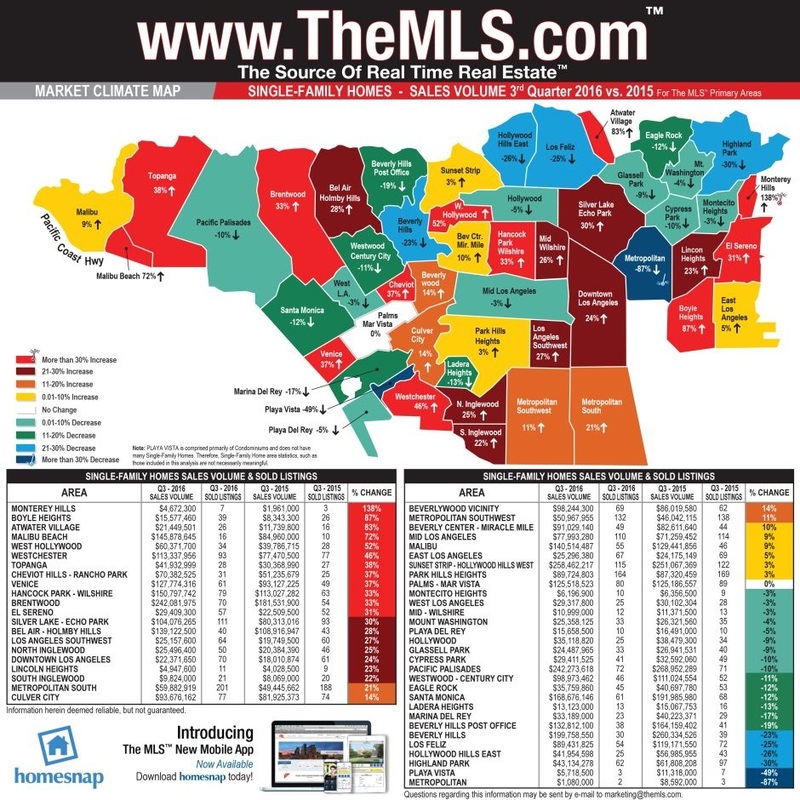 Other neighborhoods where buyers appear to be converging include Atwater Village (up 83 percent! ), West Hollywood, and Westchester. North and South Inglewood also saw decent-sized gains—suggesting the under-construction LA Rams stadium (and neighboring urban village) might be impacting prices in the area.